Philadelphia Eagles running back Josh Adams stiff arms Washington Redskins cornerback Greg Stroman during the first quarter at Lincoln Financial Field. The Philadelphia Eagles will be in something close to playoff mode the rest of this season, as they dug a big hole for themselves, starting the season at 4-6. The Birds took care of business last Sunday, getting a desperation win over the hapless New York Giants to get to 5-6, but they have a long way to go. 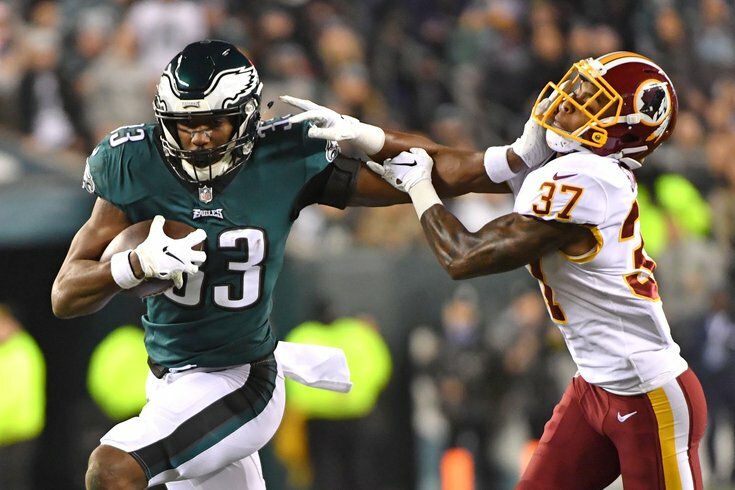 In front of a national audience on Monday Night Football, the Eagles will face another NFC East rival in the Washington Redskins in a must-win game that can help keep the Eagles' playoff chances alive. As usual, the Eagles will head into this Monday night with a laundry list of injured players. In this matchup, however, the Redskins are arguably every bit as banged-up, as they'll be without their starting quarterback, both starting guards, and their No. 1 receiver. It's also worth noting that both offensive tackles are trying to play through injuries that are likely to limit their effectiveness. As we noted in our five matchups to watch, the Eagles have to take advantage of the Redskins' hampered offensive line by pressuring Colt McCoy. On the offensive side of the ball, the Eagles' offensive line needs to build on their positive showing a week ago with another strong performance against the's Redskins' talented defensive front. Yes, I believe this game will be won or lost in the trenches. The Eagles are currently favored by 6 at most sportsbooks. Here are our staff writer picks, as well as who other publications are picking.